While we here at Lightning Cans are much more excited about the new headphones models coming out specifically designed to take full advantage of the powered lightning connector, like the affordable Philips Fidelio or stellar Audeze Sine’s. These types of headphones were designed from the outset to capitalize on the power supplied through the lightning connector by integrating amplifiers, DACs and dedicated apps for fine tuning audio. However, most audiophiles probably already own a pair of cans they’ve A.) already invested a considerable amount of money in and B.) have grown emotionally attached to. This is why so many people were upset with the dropping of the 3.5mm jack. It wasn’t because they fear change, it’s because they didn’t want to have to give up their trusty earphones they’ve been using happily for years..
Luckily, some of the new Lightning-connected replacement options are pretty cool, featuring integrated DACs to actually improve audio quality..
Well, slowly but surely, more and more options for using older headphones with the iPhone 7 are coming to market. What started as a trickle, and slowly grew into a flow with CES 2018, is now a full blown market of “adapter cables”. We go into more detail below about all the specific options for various headphone makes and models but here is a current complete list of lightning port replacement cables for some of the most popular models. For example Bose, one of the most popular “high end” headphone companies, given their consumer appeal, were frequently purchased by iPhone users. 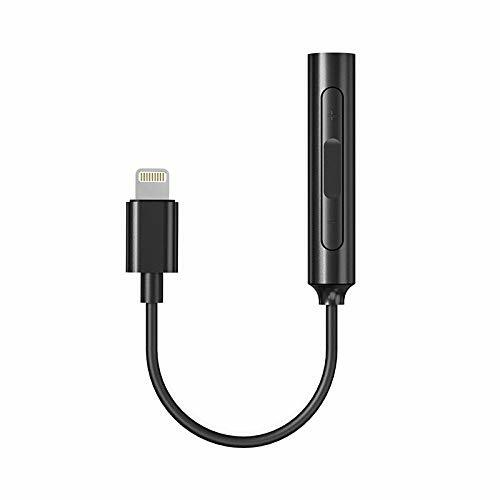 Electronics maker Scosche makes a lightning cable that can be plugged into including the Bose QuietComfort 35 (QC35), QuietComfort 25 (QC25), and SoundLink models. 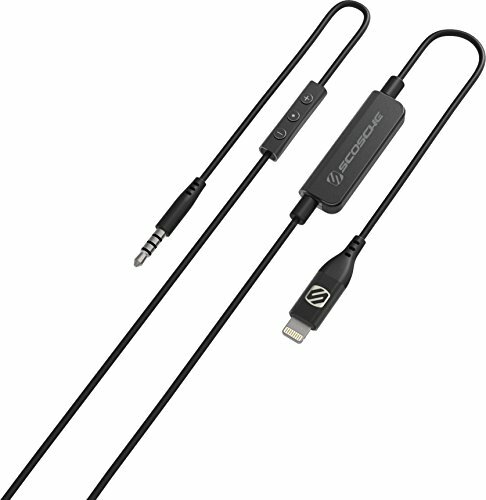 Scosche recognized this gap in the market and created one of the first 2.5mm jack-to-lightning adaptor cables that include inline mic and controls to work specifically with Bose headsets. Don’t adjust your monitor, these cables DO look exactly like the ones above. NO this is not a mistake.. they are pretty much guaranteed to be manufactured by the same factory in China. However, the NEOMUSICIA cables are marketed to a slightly different audience; Bose users. 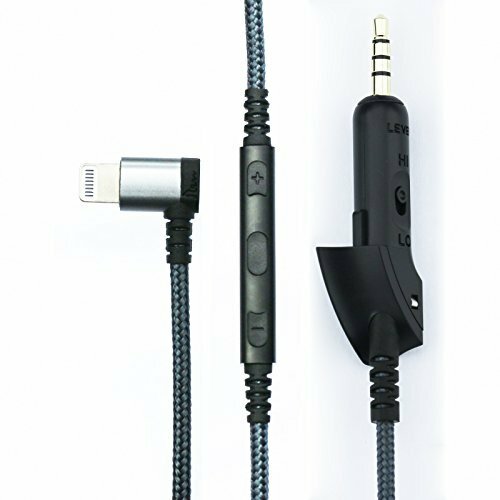 The New NEOMUSICIA are gray, have an inline mic and control, are 1.3m or 4.2 feet in length, have a braided nylon tangle-free cord, work with lightning-port Apple devices. They also come with a 1-year warranty which provides a bit of peace of mind. Soon after, Shure, perhaps THE biggest audiophile quality in-ear-monitor or earbud maker, announced they are releasing a special set of cables for their in ears as well. Works with SE215, SE315, SE425, SE535 and SE846 Sound Isolating Earphones. 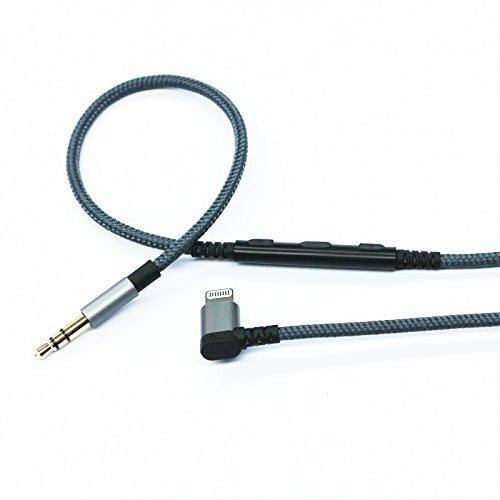 50" cable designed for use with Apple iOS devices with Lightning connectors. With Shure’s MMCX connectors on one end to connect to the earphones themselves, and a lightning pin on the other end, this little adapter bridges the gap between iPhone 7 progression and old-fashioned and trusted Shure earphones. The newest addition to the family of adaptor cables are the Ablet Audio Adapter and the New Neomusicia Adapter. If you’re wondering why we’re talking about both these cables in the same breath, it’s because they appear to be pretty much the same cable. We don’t own all of these different models so we can’t test ourselves, so if you’ve had experience, please let us know in the comments below! There are cables now for Shure, Bose, Audio-Technica and Sennheiser popular models. This is massive and will make tens of thousands of audiophiles happy knowing they won’t have to give up their beloved pair of cans/in-ears just to be able to use new Apple products. If you’re still not fully convinced on the adapter cable, then you might want to check out our homepage where we cover a wide variety of new headphones designed specifically for the iPhone 7.